Demag Industrial was one of the earliest German industrial manufacturers which has supplied European manufacturers since 1840. World renowned for Demag Cranes, and hoists as well as process automation such as plastic extrusion, chemical processing, and industrial stamping. 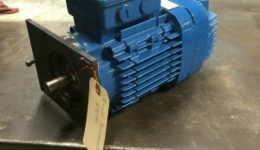 We are a DEMAG Certified Motor Repair Center. Mannesmann AG based in Düsseldorf, Germany acquired Demag in 1973, and in 1992 was consolidated under the Demag Mannesmann material Handling AG based in Wetter, Germany. The Demag KB conical-rotor brake motor features a remarkably simple, robust and reliable brake system. It is an outstanding solution wherever demanding requirements have to be met by the brake. Demag Z cylindrical-rotor motors are designed for optimum integration with Demag gearboxes and their design configurations to suit your needs. The output ratings of the 2, 4, 6 and 8-pole motors are graded according to the IEC classification. The motors are also available as two speed units or with an integrated flywheel for particularly smooth motions. The housings of motor frame sizes Z63 to Z132 are of high-quality aluminum alloy, guaranteeing high stability for a low deadweight. Motor frame sizes Z160 to Z180 feature a grey cast iron housing. 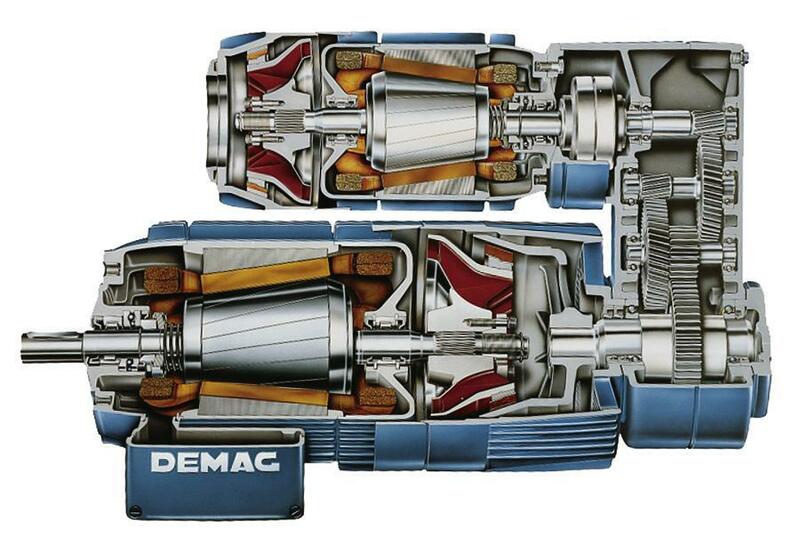 Demag Microspeed units differ from drives with speed stages and variable-speed drive systems. They represent a combination of two or more brake motors linked by a mechanical gearbox. 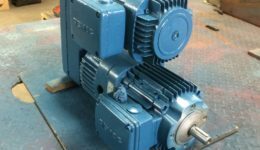 [The brake of the main motor is designed as a friction coupling, the brake of the creep speed motor acts either direct or via the gearbox of the complete drive.] A number of speeds or whole ranges of speeds can be achieved by using two speed, slip-ring or DC motors and even further Microspeed motors. Large speed ratios of up to 500 : 1 are possible. Precise stopping with creep speed motor for rapid positioning. High repeat positioning accuracy. Higher switching frequency compared to two speed motors. Creep speed constant and virtually independent of the load. American Electric is an authorized repair facility for Demag, and represents over thirty-years in Demag industrial component repair. 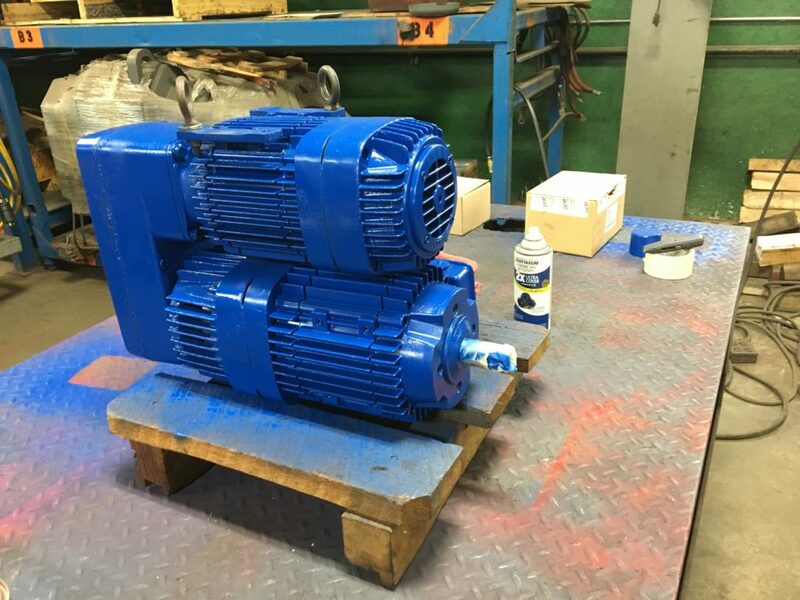 If you require new Demag electric motors, Demag component repairs, or Demag repair parts American Electric should be your source. 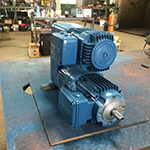 Our certified Demag motor repair facility provides full reconditioning of Demag motors. They are fully tested and certified. 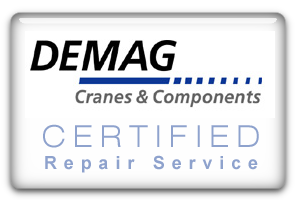 We are a certified Demag repair facility. This is one of our latest repairs.